Real-time private jet booking platform Stratajet has announced it now offer its customers the option to use Apple Pay, making Stratajet the first company of its type to provide this fast and simple way to purchase flights via its app. Apple Pay is a mobile payment and digital wallet service by Apple that lets users make payments using their iPhone or iPad. The Apple Pay system offers convenient and secure checkout – customers simply select Apple Pay on their device and place a finger on the Touch ID. Jonny Nicol, Stratajet founder and CEO, explained, “We have seen a huge growth in demand for the use of our app and we know that most of that demand is coming from people who have iOS mobiles. 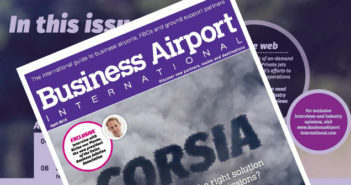 For more information on Stratajet, read an exclusive interview with Jonny Nicol in the July 2015 issue of Business Airport International.